The ivy I'm examining is on this old elderberry tree. 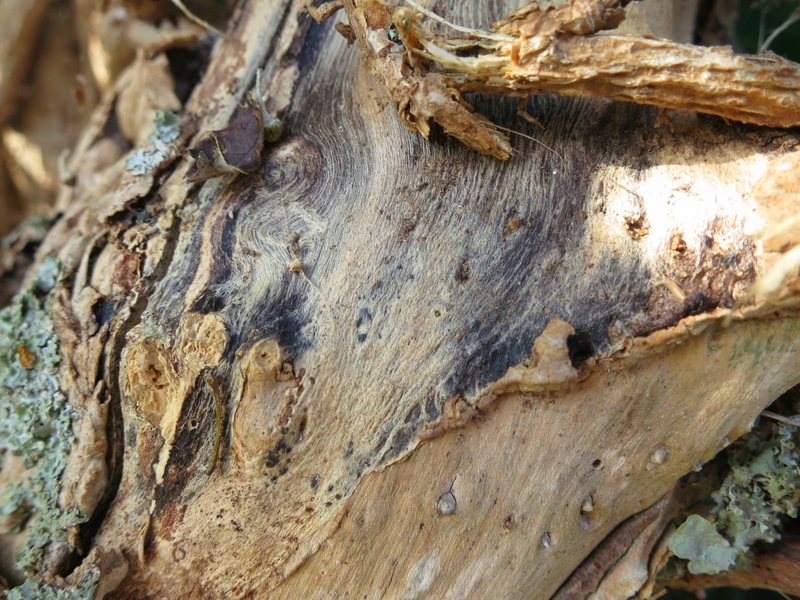 We could equally well be examining the lichen on it or the insects boring holes in the trunk. Remember I'm always saying I don't know anything? It's (almost) true. But there's a possibility (maybe a niggling hope) that one day I'll learn. I don't mind this much. Indeed I revel in it. One can get bogged down in facts. 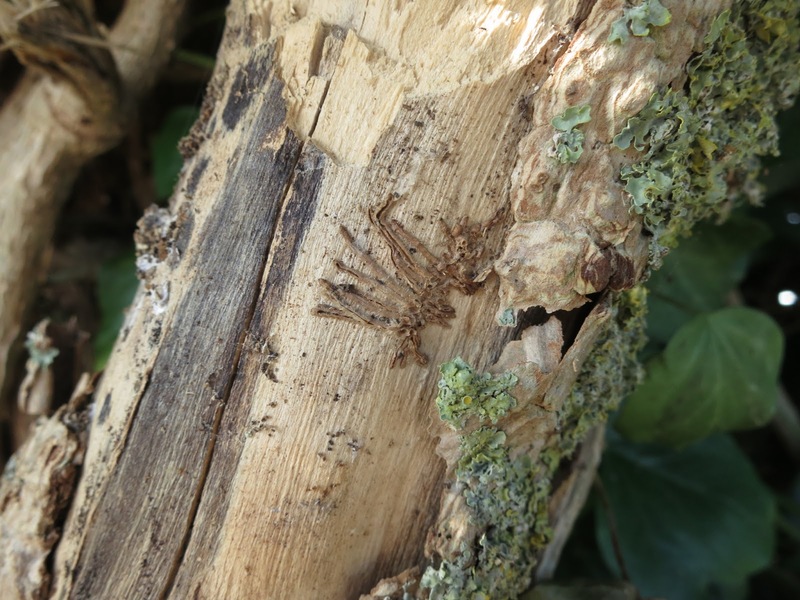 Here you can see the little roots which attach ivy stems to trees. This not-knowing is fine. It's what this blog is based on - the joy of looking, the joy of awe. BUT I find it really frustrating is when I know I CAN'T understand something however hard I try. When it's as far beyond me as any of the subjects I failed at at school. A mystery that slips through my fingers. I look around and see others busily solving the problem but I don't know where to start. The issue is a sort of blob with no obvious entry point. I've spent a ridiculous amount of time peering into flowers trying to see how they change into fruit or seeds. The theory is ok - mixture of pollens. But then what happens? And if the flower doesn't look like a flower? Ivy flowers don't look like flowers. They look like clusters of berries. If proper botanists are jumping up and down saying 'of course they look like flowers!' - I'm not the only one who's puzzled. Of those who've stopped to ask what I'm taking photos of not one person yet has realised ivy even has flowers, let alone that ivy flowers in autumn. And because ivy only flowers when it's a mature plant and on the sunny side of it and when the ivy leaves no longer look like ivy leaves . . . sometimes one has to start by persuading them it is it really is ivy we're looking at. 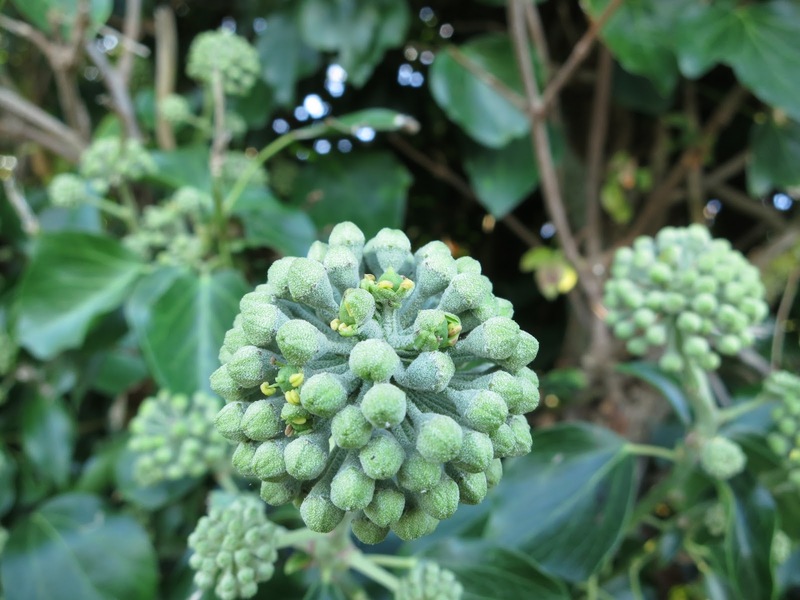 A ball shaped cluster of ivy flower buds just beginning to open. I promise you that when they do they won't look ordinary flowers. 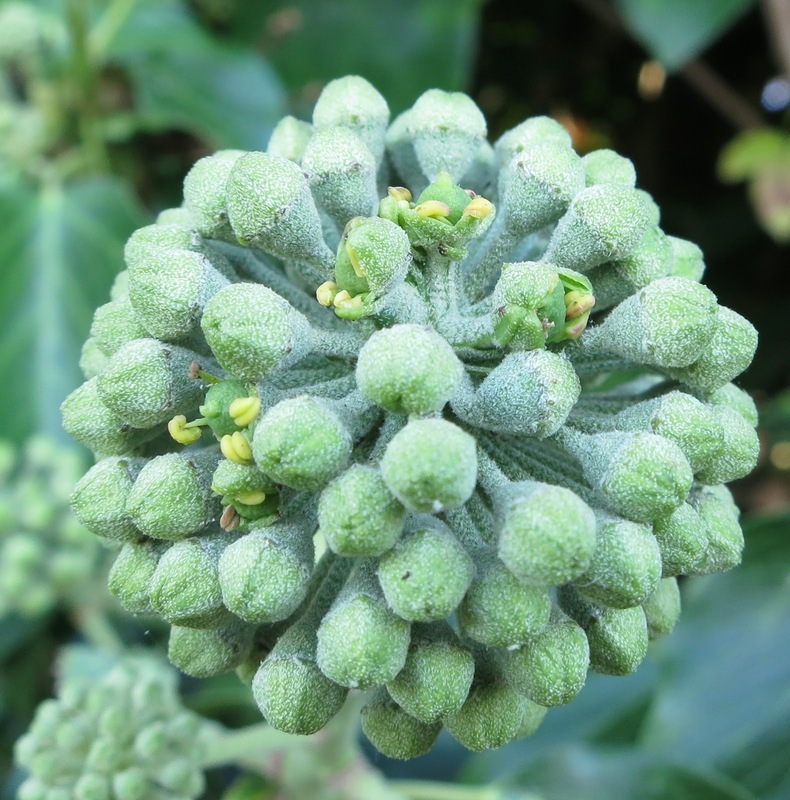 Ivy flowers are grouped in balls. The language we use about flowers sometimes bewilders me; at times it gives the impression that plants make conscious decisions about their appearance. 'Plants use their bright petals to attract insects. All very well. But where are its petals? This year, I think I'm getting a bit further with seeing what's what but there are loads of things I still haven't grasped yet. Can you help me? 1. What does it mean that mature ivy is free standing and doesn't have roots'? Do I dare find a remote tree with ivy and dig it up (the ivy that is!) when no-one's looking to find out what's happening under ground? Maybe you have some ivy you don't mind tearing out? (Not pulling down but pulling up.) Then you could tell us what you see . . . ? Please? 2. How does pollination in one place cause fruit in another? Flowers have stamens (little sticks poking up from the flower) and on the end of the stamens are little blobs (anthers) and on the anthers there's pollen (which looks like coloured dust). When the pollen is moved from one anther to another (sometimes on the same plant, sometimes from a different one) it fertilises the flower and it produces fruit. But how? The fertilisation happens on the end of the stamens. You don't get fruits there - you get them lower down where the petals are joined onto the stems. (If they have stems - dum-de-dum!) So how can that be? Fertilisation in one place. Fruit in another. 3. Does Ivy need insects to bring pollen from other ivy plants in order to produce fruit or does it work equally well with all the pollen coming from the same plant? There's no way I'll be able to tell simply by observing. I need someone to tell me. It's going to take several posts to get to grips with all this. My observations and your input may mean that what I tell you as wobbly 'facts' may have to be changed as we go along. Already the flowers have changed since I took the pictures for this post. Already I'm accumulating photographs of the insects drawn to their pollen. It'll be a marathon catch up when we get to it. If you are in the UK - find an ivy plant in flower and walk up close. There are likely to be masses of interesting flies hanging out there at present. Hoverflies are my favourite but there are likely to be loads of others too. If you are outside the UK - do you have this kind of ivy (Hedera helix) where you live? Readers Coming to the Rescue! Wa -hey! This is brilliant. On her blog 'Close to Home' Jane Strong has written a post about ivy in response to these very questions! 'Ivy for Lucy'. Thanks Jane. Much appreciated. 'Hi Loose have been having a go at answering your questions, there seems to be two camps on Ivy.. Pull it down or save it for the bees. Ivy can take many years to mature but when it dose it shifts to forming mature branches that produce fruit. There are two types of roots, vine roots when they touch the ground they grow in to the ground ( could this be the bare roots you mention) and aerial roots that help it climb "trees". Have found this post on Pollination which is a good read. and this paper as well. Pollinator Effectiveness and Fruit set in Common Ivy (Hedera helix (Araliaceae)Hope these help a little. You might also like to read the post about ivy on 'Urban Pollinators'. It's TREE FOLLOWING in less than a week (7th November) so the next ivy post will be after that. P.S. Photographs on this blog were taken on the 24th and the 28th of October 2014. How very interesting! Someone who actually looks at the flowers. Yes, I have Hedera helix; yes, it is forming blooms. But they are not as compact as yours. I can't get near it in winter because of the bees; it's the only thing blooming and the bees love it. When the flowers are finished little blue capsules form which look nice it bouquets. I've read that it takes 20 years before ivy blooms. The leaves are diamond shaped then, not lobed. The stems are upright, like a hollyhock. The pollen gets to the fruit through a tube. More later, it's 4 am; time for insomniacs to go back to bed. Hi Jane. Through a tube! When you have slept I'd be delighted if you came back with more information. 4 a.m. is a late start for sleep! Hope you are soon rested. Brick walls. Everybody has them. Mine are physics and economics. Others may have different answers from different experience. Hi Loose have been having a go at answering your questions, there seems to be two camps on Ivy.. Pull it down or save it for the bees. Hope these help a little. I found myself nodding and smiling reading this post as I'm usually as much in the dark about these things as you are. My brain hurts... But I do love mature ivy and its crazy flowers, and the way those flowers are always mobbed by insects. 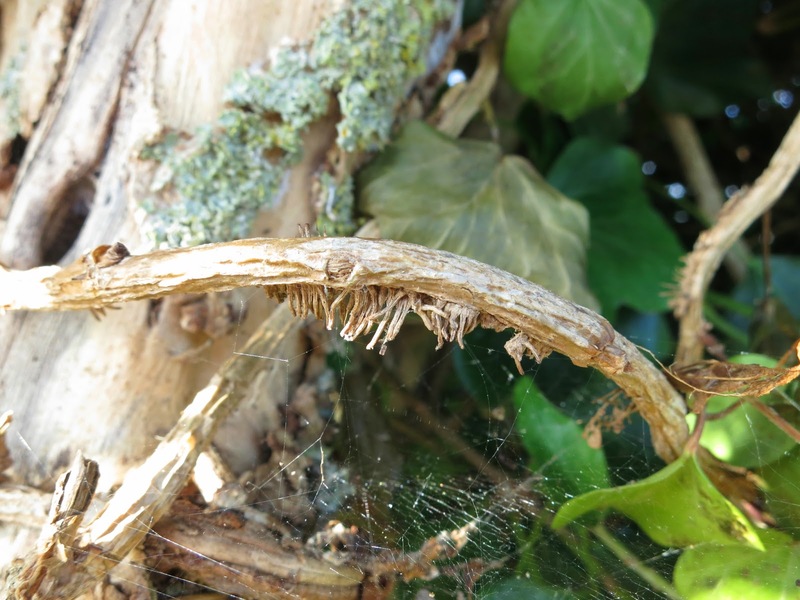 And I think the "rootless" part of mature ivy is that the branches just behave like standard shrub branches, not needing to form roots and attatch to trees/houses/fences etc for support. I am definitely not in the "tear it down" camp where ivy is concerned, but I do rip it out where it is romping thorugh borders on the ground where I want to plant other things. Hello Hollis and Amanda. Thank you so much for your explanations and links. I've added them into the text(along with Jane's). Hope that's ok.
Hello Flighty. I enjoyed your comment too; glad both that you are another ivy fan and that I'm not the only one to be bewildered by pollination / fertilisation. I usually find it's easy to gloss things over with ordinary flowers. All one needs to say is something vague like 'pollinated by bees'and we all think we know what we're talking about. Of course many readers do - and I think I thought I did in a sort of way. But these flowers are so odd they challenged me to work out what's what in their structure. Great post, lovely pix. I have also always been confused by ivy. All I know is that the the upright stems have diamond-shaped leaves and that birds eat the hard, black berries only if they are desperate! I look forward to your next bulletin. Fabulous post....totally understand where your coming from.